I love doing gift-type features as it’s my sort of cooking, and it gives me an opportunity to try out new ideas. I’m sure I’m not the only one who adores chocolate and it’s perfect for gifts. Firstly I wanted to have a go at making a large chocolate bar, but I didn’t want to just swirl white chocolate on dark, or scatter over chopped nuts or freeze-dried fruits as you see in all the shops, so I got thinking about texture and what I have in my cake decorating equipment collection that I could use. I then realised that the FMM green plastic embossers that I usually use on sugarpaste are just the right size for a bar of chocolate, and would give great texture, so I had a go. I was really pleased with the results, especially when I brushed them with a very thin layer of white chocoalte before buliding up layers of dark chocoalte to give the thickness I wanted. Everyone I showed them to immediately wanted to touch them, so I found that I had to get them wrapped as soon as possible after making them so they didn’t get finger marks on them! Chocolate transfer sheets, although not new, are something that we haven’t used a lot in any of our cookery features, and after looking through the lovely range that Squires Kitchen sell in their online shop, I decided that I’d like to have a go with them. 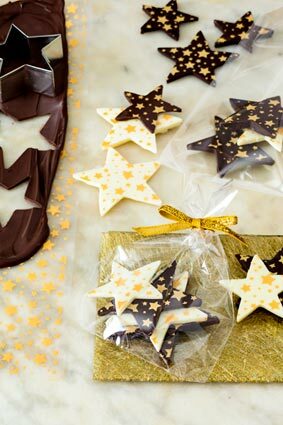 For Christmas gifts I decided the SK Gold Stars Designer Transfer would be good to use as it’s one of the designs which would look good with both dark and white chocolate, which is something to bear in mind as some of the white transfer designs don’t show up very well if you’re using them on white chocolate. 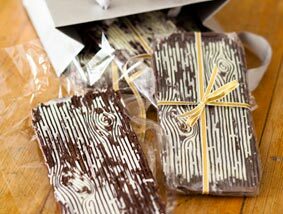 One thing to remember is that you’ll need to temper the chocolate before spreading it over the transfer sheet, othewise use a non-tempering chocolate flavour coating. 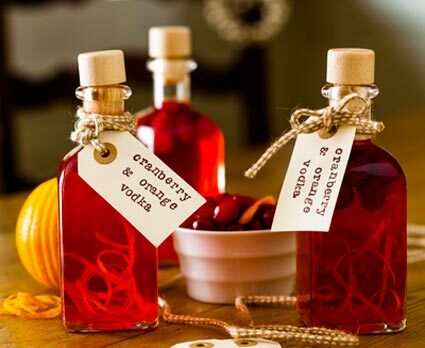 Another gift idea is Cranberry and Orange Vodka, which I can highly recommend served poured over ice, although I took some home and my husband prefers it diluted with lemonade. As I don’t like to waste anything, I took the cranberries home with me after the photo shoot which had been strained out of the vodka, and they were in my fridge while I decided what to do with them. Then last weekend I decided to cook roast turkey and I thought I’d have a go at using some in a Cranberry Relish – I didn’t actually weigh anything, but what I made was roughly based on this recipe, but I just used the soaked cranberries and no pomegranate. The result was fabulous – my husband loved it too, and was eating lots of it until I pointed out that it was actually alcoholic and so to only eat a small amount, and I didn’t let my 3-year old daughter have any (but that meant more for me), so if you do the flavoured vodka for Christmas gifts, then make sure you use the berries afterwards in something like this.